Magestic but dangerous Estuarine (Saltwater) crocodile are found in both fresh and saltwater across Kakadu National Park. Assume it is NOT safe to swim anywhere in Kakadu unless you are explicitly told otherwise by a reliable government source. After spending 8 weeks in Kakadu this year watching the season change and bushwalking as much as possible I get very excited when family and friends ask for ideas on what to do. My parents recently asked me for some ideas for a 6-7 day itinerary to visit Kakadu from the South so I thought I might as well turn it into a quick cheeky blog post with all my favourite things. For many people travelling up from the the southern states of Australia it makes sense to visit from the South. Although on a long trip your may be best to visit Darwin first for a dose of city time before venturing into the wilds of Kakadu. First of all, when I left the Jim Jim and Twin Falls were not open yet. I have had to put them on the list for next time but they come highly recommended by others. Stay: Gunlom Campground or if you want to keep the van on the Bitumen stay at the fun and friendly Mary River Roadhouse. Mary River Roadhouse also has accommodation available for non campers. Today’s Walks: Gunlom top pools walk (leaves from the right hand side of the fall). 2km Return, allow a couple of hours for the walk and for time to relax and swim at the top. The Gunlom campground is van accessible along a gravel road for most of the dry season. It’s a lovely campground a short stroll from the stunning Gunlom Falls. People swim in the lower pool however crocodiles have been found in there before and parks advises they can move into the area at any time. Parks advises the only safe place to swim in Kakadu is a pool. The walk to Gunlom Falls is short but steep and takes awhile so make sure you allow plenty of time to walk down again (you don’t want to be racing sunset down as lots of uneven steps). On the way up take care in the last part where you climb down to the waterhole, there’s not great railings or steps as it’s more natural rocks. The top pools are a popular swimming area (so wear your bathers) with beautiful views from the natural infinity pool at the top. This was my favourite experience in Kakadu as it’s one of those awe inspiring moments in nature. There is a lovely waterfall called motor car falls in the Yumikmik area however I personally found the walk itself a bit uninspiring and it takes the best part of several hours to do in the heat. The waterfall may not be running in the dry season so check with parks before hand if thats important. If I had limited time I would probably save the effort for seeing the big guns that I missed out on. However if your a fit and regular hiker then you could do this walk in the AM before Gunlom in the afternoon. 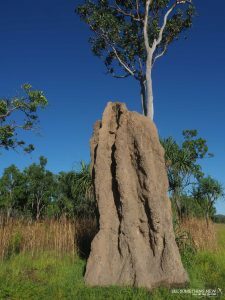 When driving through the south of the park also keep an eye out for the incredible fields of termite mounds, some taller than a house. Stay 3 Nights: Cooinda Lodge Campground or the lovely natural ‘Mardugal Two’ campground for a bush alternative. First campground on the right on the way into Mardugal Camp area. Accommodation is available at Cooinda lodge. If your feeling motivated you can fit in the 2km boulder creek walk to see the little waterfall on the way out from Gunlom. Good way to get a walk in before a day of chilling out on the boat. Bukbukluk Lookout – This is only really a 15 minutes stop so squeeze it in although I’m not sure if the van fits up there so you will need to check signage. There is a small turnaround at the top but cars park around it. Hot Tip: Kakadu Tourism do a ‘Cruise Again’ special where you can go on another cruise for just $25. This is an absolute bargain and I highly recommend doing both a sunset and sunrise tour. Warradjan Cultural Centre (sometimes has basket weaving which I never got to try but would love to). This centre is a must do, its free and tells the stories of the Indigenous People from the the Kakadu Region. 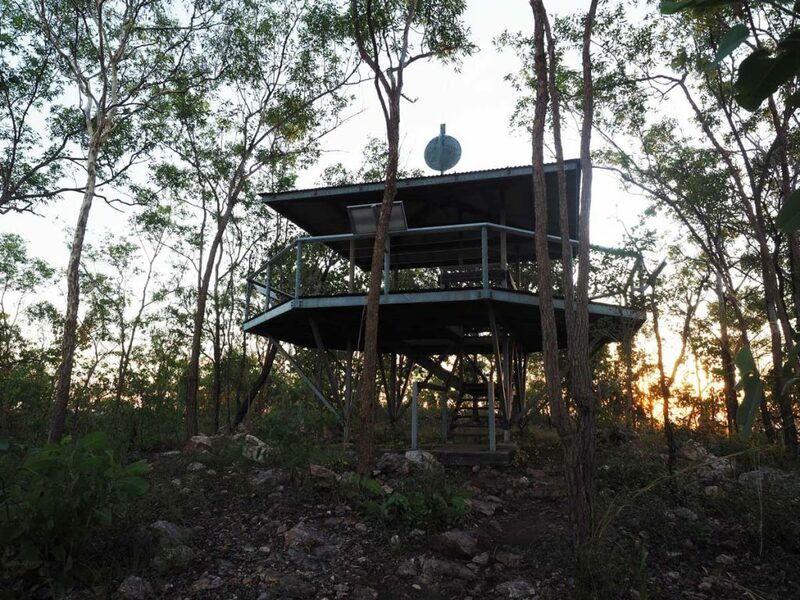 The Visitor Information Centre in the north (visit when staying in Jabiru Region) focuses on the natural values of the park so both are a must do. Full day excursion to Jim Jim and/or Twin Falls (you need a 4wd for this option). This will be a big day with around 4 hours of walking (each walk is a couple of hours according to the visitors guide) plus some longer 4wd track driving. If you would like more time in this area you will need to leave the van and take the tent in to the campground at Garnamarr. Stay: Jabiru in a Caravan Park (the Aurora kakadu lodge has a nice pool and fun pool bar) or one of the campgrounds just south of the visitors centre (I actually can’t remember which one is better, hit up your camping app). Mirrai Lookout is a lovely lookout with filtered views in all 4 directions of the park. I actually really enjoyed it and it’s a chance to get the blood pumping. 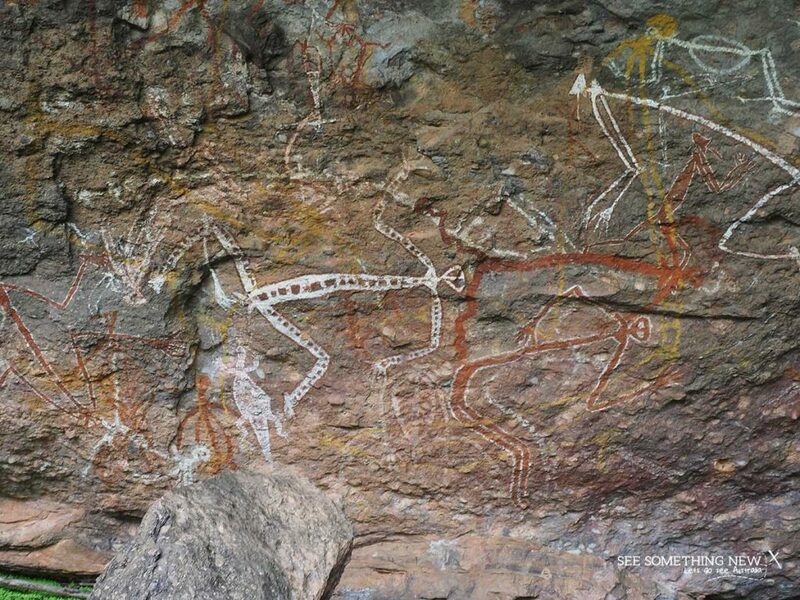 Nourlangie is a nice circuit walk (very very busy) with the chance to see some incredible Indigenous Art. It has lots of shady sections along the way. I head to the left on the first turnoff track and do all the side parts so on the way back you can just walk the nice flat track back to the car. Beautiful art sites are easily accessible on the ‘Nourlangie’ walk which takes you to art sites in the area around Burrunggui and Anbangbang. This is the Indigenous name for the area in Gun-djeihmi, the language now most commonly spoken in the park. Anbanabang Billabong is also in this area, I really wanted to do it but was still closed so can’t tell you what its like. But it’s a reccomended walk by parks. Kakadu Visitor information centre. Allow a couple of hours to read everything, the doco they play in the theatre on Kakadu is incredible, telling the stories of the parks and the rangers who work there. Also the theatre is a good place for aircon after walking 😉 😉 Theres also a café. Its only a 5 min drive from Jabiru so you can set up your campsite then come back. You have the option of sunset at Nawurlandja, it’s a nice spot to finish the day and much quieter than Ubirr but definitely not as impressive. If you can only do one make it Ubirr, it’s a magic experience, albeight crowded. Nanguluwur (4km return, not much shade) was my favourite art site out of the ones that I got to see because there was far fewer people because it takes more effort to get there. Its just one long cave in the middle of the bush and I found it awe inspiring. Take the printed guide to art in Kakadu as there is a range of different aged art at this site including ‘contact art’ depicting a ship. This is also a good chance to do the Anbanabang walk if you didn’t fit it in on a previous day. For sunset head to Ubirr today, tomorrow or both. Back track to Nouglagie again if you need to fit in any of the walks still. Gubara pools walk is pretty at the end but a long way with no shade before you get there. If your up for another cruise you could do the Guluyambi boat cruise in the East Alligator Region, its highly rated on trip advisor for its cultural content but I have never had a chance to do it. Cahills Crossing, spot crocs from the viewing platform next to the crossing. Please don’t even consider fishing or entering the water here (or most places in Kakadu) unfortunately people have been killed by crocodiles at this spot. Sunset at Ubirr. There is more art sites there as well so get there with plenty of time to enjoy them but do take inspect spray. For a good sunset spot head up to Ubirr earlier if you can. Its magic up there, a prehistoric landscape of rocky outcrops. If you can fit in a second night its worthwhile as sunset is different every night. 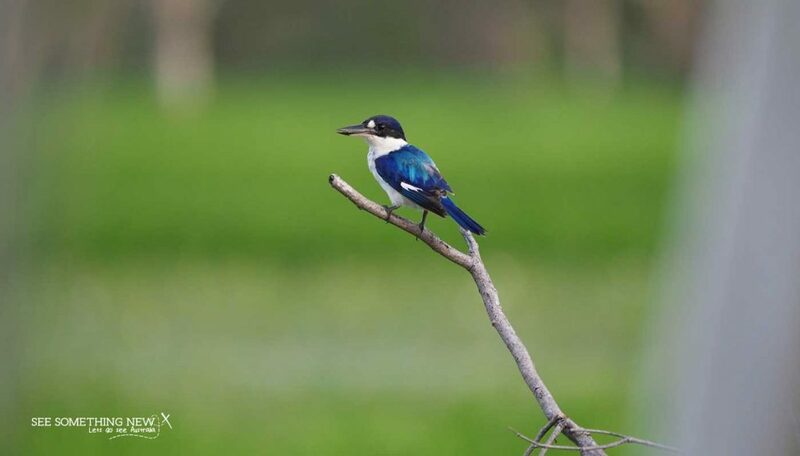 Call in at Mamukala Wetlands to spot birds from the hide (not sure what its like in dry season) and enjoy driving through sections of panadanus and flood plains. Watch for crocs when driving over the South Alligator River. It’s now time to farewell the stunning Kakadu, and leave a little piece of your heart there for the next time you come back to visit. Spot Rainbow Bee Eaters near water, to find them listen carefully as you will here them trill while soaring out from branches. Also look out for colourful little kingfishers. I Hope this helps you plan your visit from the South 🙂 Enjoy the beautiful ancient experience that is Kakadu National Park.